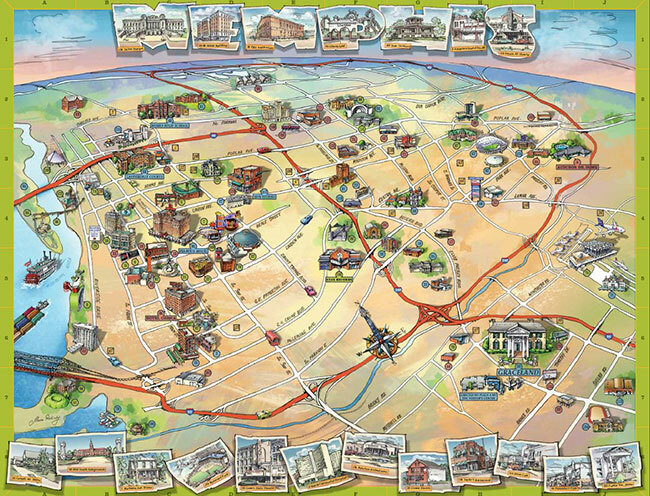 Memphis Map For Elvis Fans - Misc. Andrea Shaw created the first map that tells Elvis’s story by illustrating where he lived, worked and played in his home city. I ordered one of these maps. It's very well done, and truly made for Elvis fans. But beware, the postage and handling charges are a rip off! Does it show the rubberduck-stores as well?.. Does it have the hot spots were you can get mugged? Very nice, it puts everything into context. I have been to Memphis, but still struggle to remember where places are in relation to others. This is really not the first map of Elvis sites in Memphis, but it looks good & is the first laminated one I've seen. It certainly should be a useful addition to Elvis travellers. If you order from the UK the map costs £6.40 plus £5.13 p&p! Many thanks to you Andrea ! This is also about "taking care of business" ! Very helpful and of great utility ! I have been in Memphis 9 times since 1969 and it never ceased to amaze me how "new" places are found and/or visited by me each time.